Moisture meters are among a woodworker’s best friends. This handy device measures the moisture content in wood, so you’re able to determine if it’s stable enough for you to use it. This way you’ll know if your lumber is too wet or dry to use for specific home improvement, building, or other woodworking projects! Or, you can use one to detect possible sources of moisture damage in your home, such as from leaks or floods. Moisture meters come in two types: pin and pinless. A pin moisture meter measures the moisture content of wood by using two metal pins inserted into the wood. A pinless moisture meter uses a sensor pad placed flat against a board to measure, so there’s no insertion involved. We’ll discuss the pros and cons of each later on in this article. Here are some of our favorite best moisture meters for wood to share with you! 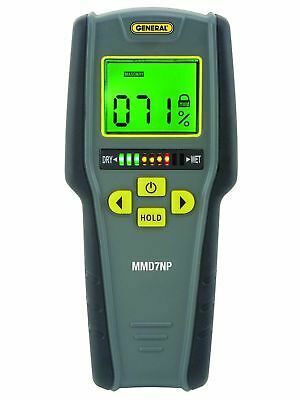 The General Tools MMD7NP is a simple to use, simple to read pinless moisture meter. Simply scan the meter over drywall or wood to detect moisture that might catalyze mold growth or otherwise damage the material. Also, use this meter to accurately detect places where flooding or leaks may have occurred in your home or shop. The MMD7NP contains an easy-to-read 2-inch, a diagonally-lit LCD display that shows you the percentage of moisture in a given area. A tricolor bar graph also indicates the level of wetness or dryness in your wood or drywall. The pinless feature of this meter scans large areas quickly to effectively find moisture. Additionally, it does not leave any pin holes in your material that pin meters do. This small meter measures 1.1 x 3 x 6.5 inches and weighs 4 oz. The moisture detection tool has a 3/4 in. maximum sensing depth and is +4/-4% accurate on wood. This tool auto-calibrates and runs on a 9V battery. The moisture meter features a HOLD button to keep the meter at the level of moisture, an auto power-off function, an out-of-range alarm, and low battery indication. The MMD7NP also comes with a one-year warranty. The MMD7NP moisture meter is a great tool for anyone, whether you’re a DIY enthusiast, a woodworker, a building inspector, or a contractor! The pinless feature doesn’t harm your walls or any finished wood surface, leaving it as clean as when you last left it. Additionally, the LCD screen is easy-to-read, and the tricolor meter gives you a quick visual to see where the moisture level is at. Sometimes the LCD display can be hard to read at an angle or in bright light. This can make it difficult to get an accurate reading. Lastly, the auto power off function might function a little too quickly for you. Overall, however, this is a good, budget-friendly meter perfect for use with almost any project! 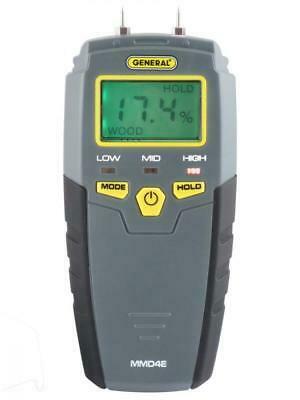 The General Tools MMD4E pin-type moisture meter comes in an ergonomic design to fit in one hand. The easy-to-read LCD indicates how much moisture is apparent in wood through two metal pins at the top of the tool. This essential tool helps you to not only find water damage in your home but also helps determine which lumber you should buy for your woodworking projects. The MMD4E moisture meter comes with two stainless steel pins. Simply insert these into your wood or drywall, and the tool will find the moisture level. The LCD screen indicates the moisture content as a percentage. There is both a low and high-level indicator so you can see the moisture content at a glance. The MMD4E measures 5.5 x 9.1 x 1.4 inches, and it weighs 6.4 oz. This meter also has an Auto Power Off feature to save power! The MMD4E is another excellent choice for a moisture meter. Its ergonomic design allows you to use it in one hand, giving you the ease to brace the wood or yourself. The moisture meter has a wide and precise measuring range. The clear display presents an accurate and precise reading, so you’re sure to have the correct measurement every time. It works for all sorts of materials including wood, drywall, and subflooring. With a pin-type meter, however, you might need to wriggle or adjust the pins in order to find a consistent reading. It won’t necessarily always find a reading the first time. This meter may also require testing several areas to verify the accuracy of your readings. 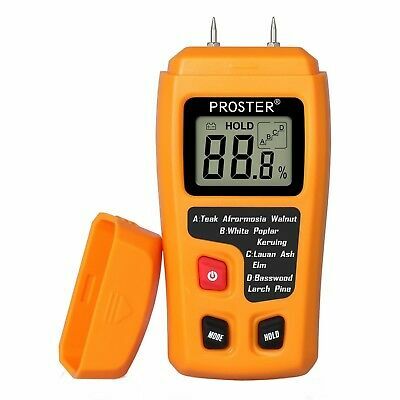 If you’re looking for a budget-friendly moisture meter packed with features, you’ll want to look at the Proster Digital Wood moisture meter. Specifically designed for wood and wood-based products, this pin-type moisture meter is sure to provide you with accurate readings. The damp moisture reader gathers information on moisture content in wood, paper, drywall, cardboard, and other wood-based products. Its LCD display clearly shows the moisture content, and it also shows if you’re holding a reading on pause. The Proster meter’s memory contains information on four wood groups with calibrations for over 50 tree species. The Proster meter measures 5.9 x 3.2 x 1.6 inches and weighs 8.2 ounces. It runs on a 9V battery. This meter has a range of 0 – 99.9% moisture content and is accurate by + 0.5 / – 0.5% of the shown reading. Some other features include an auto Power Off setting (that is triggered after 15 minutes), impact-proof housing, and a built-in battery check and low battery display setting. The packaging includes the meter, a protective cap, and a carrying case. 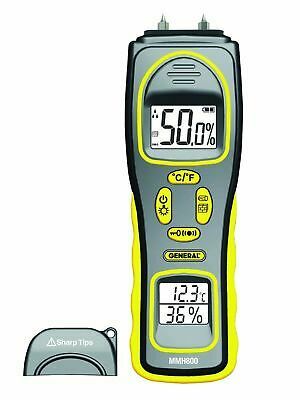 This digital moisture meter is an excellent addition to your toolkit. It’s an inexpensive, durable meter that measures moisture in wood, drywall, and other materials and also has calibration settings for over 50 species of wood. Its LCD screen shows you a measurement that’s accurate to within + 0.5 /- 0.5% of the shown percentage. Lastly, a Power Off setting consumes less battery life over time. As with other pin meters, you might need to probe your materials a few times to get a consistent reading. You also might encounter some difficulty at reading the LCD screen in direct sunlight or at an angle. 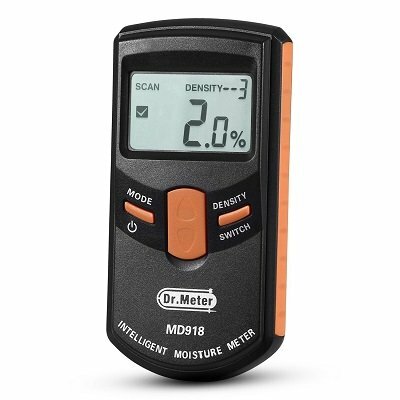 The Dr.meter pinless wood moisture meter is a versatile, sturdy moisture meter that works on a variety of materials. It uses an intelligent system to measure the moisture content through the HF electromagnetic waves without making any pinholes in the wood’s surface. This non-invasive, non-marring meter uses electromagnetic waves to scan the moisture content in your material whether it’s wood, paper, carton, bamboo, or tobacco. A large digital LCD gives you clear measurements, and an auto-off feature shuts down the meter after approximately five minutes. Its design is perfect for any level of woodworker, contractor, builder, or DIY enthusiast. The MD918 meter measures 5.1 x 2.6 x 1 inches and weighs 7.2 ounces. It runs on three 1.5V batteries. This meter has a range of 4 – 80% moisture content and is accurate by + 0.5 / – 0.5% of the shown reading. Some other features include a built-in battery check and low battery display setting. The packaging includes the meter, three 1.5V batteries, a carrying pouch, a user manual, and a card. The MD918 also comes with a money-back guarantee and a warranty. The MD918 meter is an excellent pinless option if you’re looking for something to last for years. The easy-to-read display works well in many conditions, and it automatically shuts down in five minutes. The meter operates on a wide range of materials for a variety of functions including finding water damage and determining if the wood is stable enough for use. Unfortunately, calibration isn’t automatic. You’ll need to remove the batteries and then replace them in order to calibrate the meter. Also, the battery compartment does not always stay shut. On the whole, however, this is a solid, durable, reliable moisture meter. 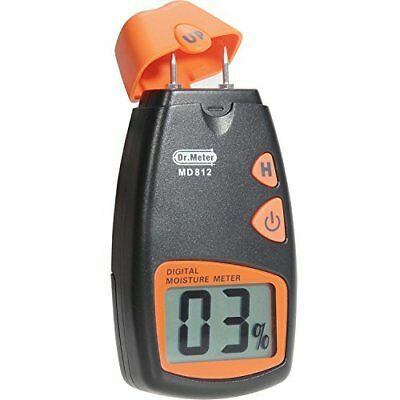 This unique dual moisture pin meter measures not only moisture but also temperature in a variety of materials including concrete, wood, drywall, and other types of building materials. It’s great for detecting water damage, leaks, possible mold growth spots, and wet spots in wood or other materials. The Sam-Pro Tools meter features two metal prongs for detecting water. Once you place the prongs into the material, a reading will appear after a couple of seconds. Its easy-to-use and ergonomic design makes it comfortable to use. It also includes options for max/min, scan, and hold. This meter measures 8.8 x 4.6 x 1.9 inches and weighs 5.6 oz. The LCD screen is also backlit if you need to view the measurement reading in low-light conditions. The packaging includes the moisture meter, carrying case, four sensor probes, 9V battery, and owner’s manual. This meter is a reasonably-priced option if you’re looking for a pin meter. The sturdy, ergonomic design fits well to your hand, and it works admirably to identify moisture in wood. You’ll want to use this to determine if lumber you’ve purchased is seasoned enough to use. The LCD backlit screen is excellent to view readings in low-light conditions. Overall, it’s simple to use and easy to read. Unfortunately, the cap that covers the prong can be challenging to remove. Sometimes it requires brute force or a tool to remove it. The Sam-Pro meter also does not work with concrete or cement floors. This meter is relatively limited in what it can measure moisture in. Lastly, it may not be as accurate as some other meters. Dr.meter, a well-respected moisture meter brand, presents another great option. 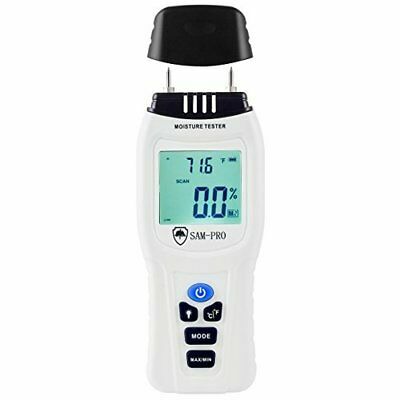 The MD812 pin moisture meter gives precise and accurate measurements and displays it on a large digital LCD screen for quick and easy reading. This Dr.meter meter features a two-pin sensor to measure the moisture content in wood, sheetrock, plaster, sub-flooring, and other areas. The large digital LCD screen shows the readings quickly. You are able to change the sensor pins based on application. This meter measures 5.7 x 3.5 x 2 inches and weighs 6.7 oz. The testing range extends from 5-40% and is accurate to within +1/-1% of the shown reading. Some other features include a built-in low battery display setting, battery status indication, and audible alarms. The packaging includes the moisture meter, carrying case, operating manual, a 9V battery, and two spare sensor pins. The Dr.meter MD812 presents itself as a solid pin meter. Its ability to test a wide range of materials makes it a great contender in this list. You can apply it to a variety of functions including woodworking, building construction, agriculture restoration, and floor-laying. Its ergonomic design is comfortable to use in almost any situation. It regularly provides consistent readings. Unfortunately, this meter lacks some of the accuracy of other meters. Its range only goes from 0-40% while others extend out further. It also has a margin of error of +/- 1% whereas some others have less. Lastly, the on/off switch does come on easily, so it’s possible this will drain the meter’s battery. The General Tools MMH800 combines the best of both worlds in terms of moisture meters. It operates as both a pin and pinless meter. The meter has both two pins at the top and dual pad sensors to scan wood and other materials. The MMH800 features both pins and sensor pads to make it operate as a dual meter. It also measures temperature and humidity. The meter features two easy-to-read displays – one for moisture content and one for temperature and humidity, Lastly, it has an auto diagnostic check and an auto power off. This meter measures 3.6 x 8.1 x 12 inches and weighs 2 lbs. The testing range extends from 5-50% (with wood) and 1.5-33% (for building materials) and is accurate to within +3/-3% of the shown reading. The MMH800 also offers an audible indication of moisture level and storage of moisture level readings. It also powers off after three minutes. The packaging includes the moisture meter, 9V battery, lanyard, two sets of spare pins, and a user’s manual. This is perhaps one of the best moisture meters out there. Although the price runs a little higher than most meters, the 4-in-one combination of functions (pin meter, pinless meter, humidity reading, and temperature reading) offer you more value than almost any other meter. Not only does it offer two displays, but the meter is also able to distinguish between wet spots and dry spots with reasonable accuracy. Unfortunately, this one does not always provide the most accurate readings. It only offers readings with a +/- 3% margin of error whereas others advertise much lower margin of errors. What Is the Best Moisture Meter for Wood? Of the choices listed above, we love the General Tools MMD7NP Moisture Meter, Pinless, Digital LCD with Tricolor Bar Graph. Although both pinless and pin meters have their merits, the MMD7NP meter offers the best of both features and value. This is a great first moisture meter if you haven’t purchased one before. It’s sturdy, accurate, and simple to use. Although you might need to test a few different areas to ensure a consistent reading, you won’t have to bore into the wood to do so. How Do You Test for Moisture in Wood? Testing for moisture in wood is quite simple. This happens in one of two ways, depending on the meter. With pin meters, all you do is insert the two prongs into the wood and wait for the meter to pick up a reading. Electricity flows between the two prongs – since water conducts better than wood, the meter determines the moisture content by measuring the current. Keep in mind that pin meters are sensitive to temperature variations within the wood, so pin meters always come with temperature correction charts. At What Moisture Content Does Wood Rot? The moisture content at which wood rots depends on the species of tree and the humidity conditions in which the wood exists. But typically wood rots at a moisture content at 30% or more – this is the point at which fungal spores usually germinate. Spores can take a few days to become visible, but if you have dry wood that shows moisture content at 30% or above, you should consider drying it out. What Is the Ideal Moisture Content of Wood? The ideal moisture content for wood depends on the wood and its function. According to Wagner Meters, “the acceptable moisture level for wood objects used indoors is generally 6% to 8% for wood flooring, 6% to 9% furniture, and 9% to 14% for construction”. How Much Moisture Should Hardwood Floors Have? Hardwood floors should have approximately 6 – 8% moisture content, based on common recommendations. How to Choose a Moisture Meter? The first thing to determine is which meter you’d prefer: a pin or a pinless meter. It depends on what you plan to use the meter for. If you buy surfaced wood which you wouldn’t like to poke holes in, you might consider a pinless model. There are no prongs to insert into the wood, just the sensor plates. If you use rough lumber, extremely thick wood, or if you dry your own wood, consider a pin meter. You don’t have to have a smooth surface on which to place sensors. You can insert the pins almost anywhere along the length or width of the wood you’re testing. Because pinless meters utilize sensor plates, consider the minimum sample size needed to obtain an accurate reading. It’s important to find a meter that isn’t too large for the wood that you’ll be testing. This is one of the most important considerations of any meter you purchase. If you’re just looking your run-of-the-mill meter to handle wood you purchase from your local hardware store or a lumberyard, you’ll be fine with a moisture content range of 7-20%. According to Popular Woodworking, it’s impossible to accurately moisture content past 30%. Some might purchase a meter with a higher moisture content range, but they are those who are usually drying their own wood and need to track how fast their wood is drying. Pricing is always a consideration when purchasing a meter. Some cheaper meters offer great value while still providing accurate and consistent readings and other features. Keep in mind, however, that their quality may not be as high as some other more expensive options. That’s not to say they are not worth purchasing. Rather, consider how often you’ll use your moisture meter. It’s probably worth spending some more money on a good, solid meter with quality construction rather than something that might last you a year and not have all of the features you’d like. The meters in this list all fall within a reasonable budget. They each have their quirks, but all ultimately get the job done! In conclusion, we’ve provided you with some information on moisture meters, reviewed some of our favorites, and offered some practical advice on what to think about when choosing a meter. 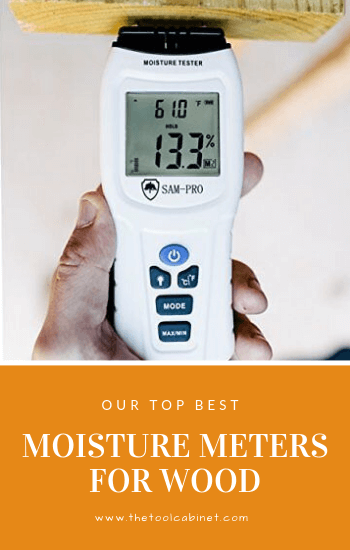 Overall, it’s important to consider which meter you’d like to purchase, which moisture content range you’re looking for, which function you’ll use it for, and other factors. We wish you the best of luck in your search, and we hope you found this article insightful and informative! I hope you found our Best Moisture Meters for Wood article useful. Do you have any other questions about any other Moisture Meter brand?